Paytm Running Cashback offer On First Recharge of the month Giving Rs.10 Cashback On Recharge Of Rs.10 Using Coupon Code MONTHLY10. Get Now!! Flat Rs. 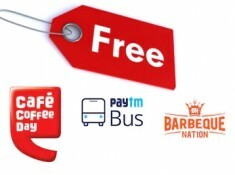 10 cashback on recharge or bill payment of Rs.10 or more. pramod7 Maintain specific account,Error showing This offer is not applicable on this account.